Luke chapter 19 is packed from end-to-end with signs of Christ’s Advent. His gifts during his Advent to the city of Jerusalem highlighted the fact that he was not the king the city wanted. He gave the gift of his presence, salvation, and peace to Zacchaeus—a traitor, a government thug, and a corporate thief. He gave, in his parable, more resources to the already rich, over the objections of the crowd. Then he ran the rich and powerful out of the Temple in order to give it back to the outcasts, the foreigners, the blind, and the lame. Jesus is, for some, the unwanted king of the parable. His Advent will frustrate those who wait for earthly adulation and success. But Jesus is for others, the yearned for King of Glory. He endlessly supplies those whose hopes rise higher. What we hope for in Advent is not a political power broker. What we hope for in Advent is not a market economist. What we hope for in Advent is not a government regulatory watchdog. What we hope for in Advent is not a resource of earthly wealth, success, fame, and power. The king we hope for brings healing. The king we hope for brings peace. The king we hope for brings love. In the season of Advent, we climb out, hopefully, on a limb with Zacchaeus. We run ahead, inquiring about a colt, like the disciples. We line the streets, hopefully, straining to see his approach. We lay down our cloaks, marking his entrance into our lives with our sacrifice and humility. We linger outside the Temple, waiting for his zeal to drive out the greedy and powerful, making room for us—the broken, the blind, the sick, and the outcast. The king we hope for brings the glory of Heaven to earth in our hearts and expresses his love through our lives. 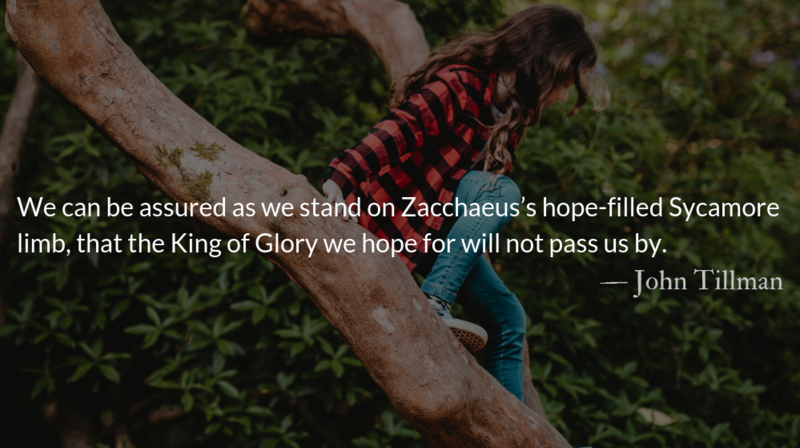 We can be assured as we stand on Zacchaeus’s hope-filled Sycamore limb, that the King of Glory we hope for will not pass us by. The colt will carry our King. And in the end, all the broken who enter the courts of His temple, will be healed. What are you waiting for? Climb up on the limb in hope. Hope is personal. Very personal. Whether through worship, adversity, desperation or pain, we collide into the reality that our only hope is Jesus. Jesus chose to go out of his way to reach out to despised people—tax collectors, prostitutes, Samaritans, Roman Centurions, lepers, adulterers, foreigners. We must choose to manifest his same radical love and outreach to outcasts.